We review the HOYA PRO1 Digital Circular Polarising filter, one of the most effective and useful filters to have. Find out how it performs in our review. 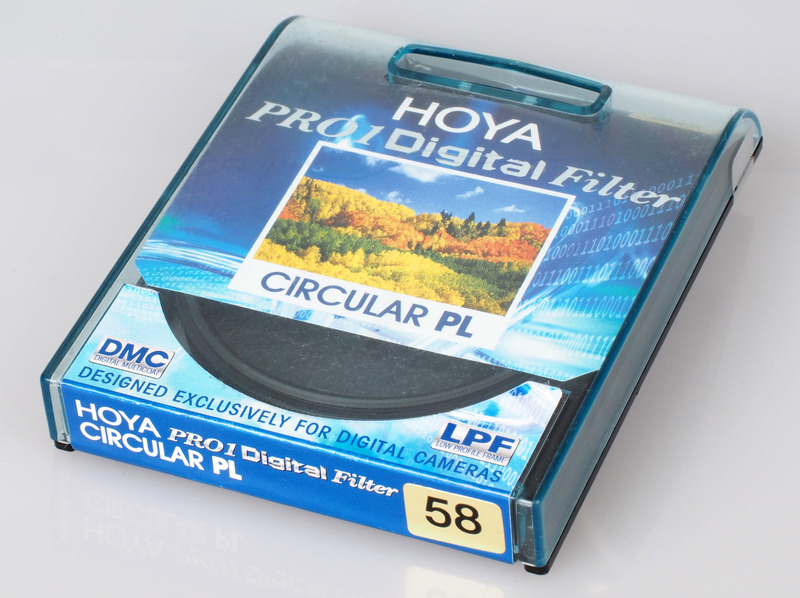 Often described as "the most important filter you can have in your collection", the Hoya PRO1 Digital Circular polarising filter is a slim filter designed for use with digital cameras. Made to give saturated blue skies, clear views, and cut down on unwanted reflections, we find out how this circular polarising filter performs in a variety of situations. The HOYA Pro1 Digital Circular Polarising filter features a multi-coating (MC), to reduce flare and ghosting; a matt black aluminium frame to reduce reflections; along with a black rim around the glass to reduce the chance of reflections further. All packed into a slim, low-profile frame, to help avoid vignetting on wide-angle lenses, but not so thin that you can't attach a lens cap to the front. Black Almite Frame - Filters feature a black matte aluminium satin finish almite frame which reduces reflections. The filter is available in a large number of sizes, suitable for mirrorless camera lenses as well as Digital SLR lenses, with sizes from 37mm, 40.5mm, 43mm, 46mm, 49mm, 52mm, 55mm, 58mm, 62mm, 67mm, 72mm, 77mm, to 82mm. The filter looks noticeably dark when mounted to a lens, matching the black bodies of most cameras. It also provides protection for the front lens element, and matches the Panasonic Lumix X Vario 12-35mm f/2.8 lens with a thin profile that is barely thicker than a standard UV filter. We've shown a side view of the HOYA Pro1 Digital CIR-PL filter next to a generic circular polarising filter to show the difference in the thickness of the filters. Attaching the filter to the front of the lens is straightforward and is simply a case of screwing onto the lens thread - the edge closest to the camera is grooved so that attaching and removing the filter is easy. 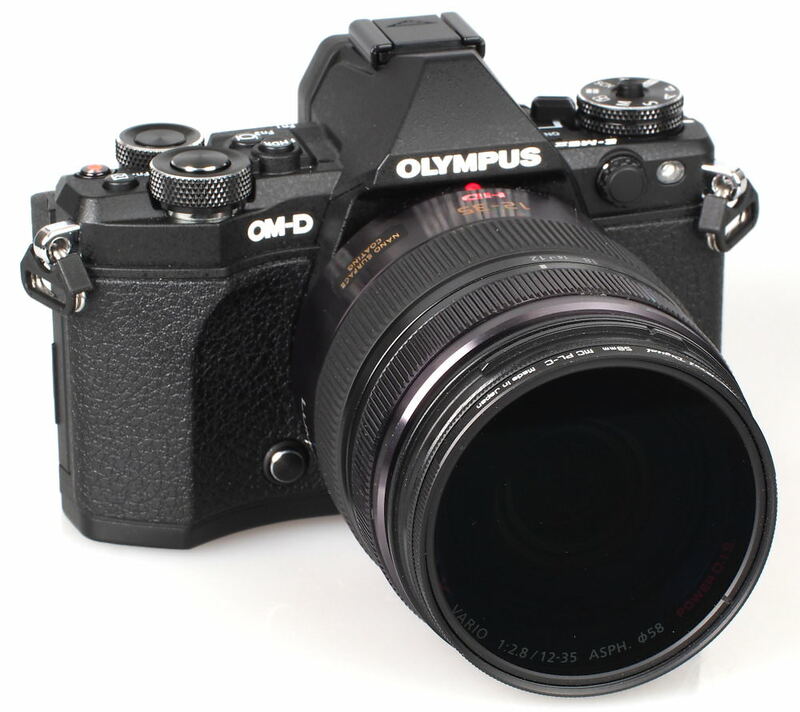 In use, the front ring turns easily (unlike the cheaper generic circular polarising filter shown above), and you are able to see the effects produced by the filter immediately on the screen or through the viewfinder. When the filter is turned to the desired position, it stays in place so that you can adjust exposure if using manual settings. Alternatively, when using the camera's auto-exposure the camera will compensate for the change in exposure. The circular polarising filter can be used to dramatically improve the saturation and contrast of blue skies. If there are clouds in the shot then it helps clouds stand out from the sky letting you more clearly see the clouds, and gives an overall much more dramatic photo. The polarising filter also improves the appearance of some plant leaves, which can give a much richer image, with more noticeable green leaves. When shooting glass, it's possible to remove a number of reflections and glare with a dramatic difference in the shot with and without the filter with the second shot showing the reflection of the clouds has almost completely gone. This can be useful when shooting through glass, and it can also be used to shoot products and remove glare and reflections on plastics. When using the filter, the exposure is longer and the camera automatically selects a slower shutter speed and aperture. Image quality is excellent with no loss of detail visible and sharp results even into the corners of the frame when shooting with a wide-angle lens. Shooting with the sun in the frame, the filter performs extremely well, cutting down on flare slightly, without introducing any additional flare or ghosting. 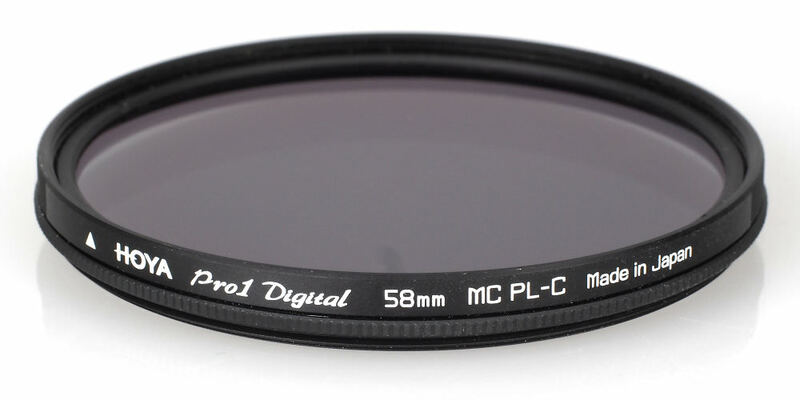 The HOYA PRO1 D CIR-PL 58mm filter is available for £64, which is a similar price to the Hoya 58mm REVO SMC Circular Polarising Filter, at £59. 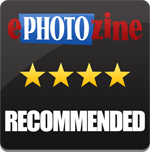 Alternatives include: the Kenko 58mm Digital Zeta EX Circular Polariser Filter at £84, B+W 58mm MRC Circular Polariser Filter at £89, Tiffen 58mm Circular Polarising Filter at £34, Tiffen HT 58mm Circular Polarising Filter at £131, and a Kood 58mm Circular Polarising Filter for £23, although this is not a slim model. Another alternative includes the Cokin P164 Circular Polariser for £72 which also needs a P series filter holder (around £12), or a Lee Filters Circular Polarising filter is available for around £219 excluding the holder. The HOYA PRO1 Digital Circular Polarising filter performs extremely well, producing images with excellent colour, as well as reducing flare in some situations. The filter is thin, light, easy to use and relatively good value for money. The uses for this filter include reducing reflections when shooting through glass, water, plastics and other surfaces that are reflective. 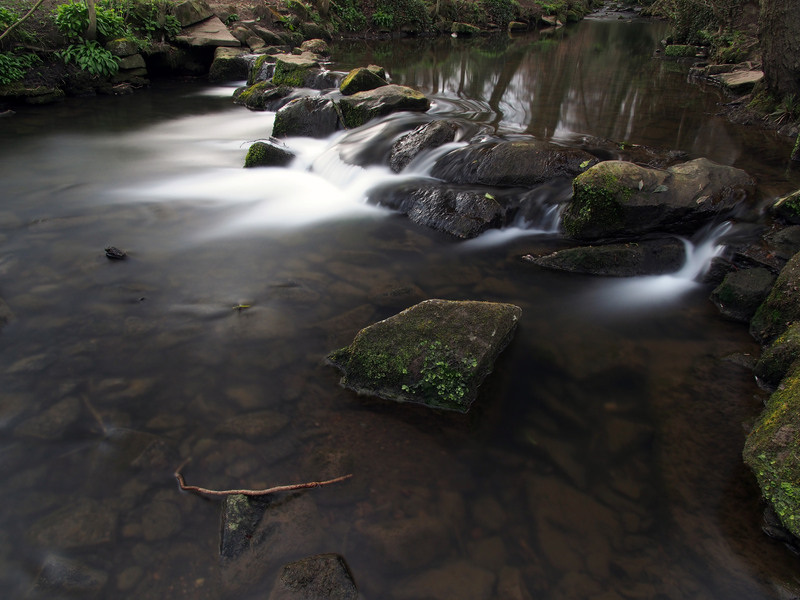 It can also improve greens and blues in landscape photography, as well as being useful for long exposure photography when used with ND filters. The HOYA PRO1 Digital Circular polarising filter makes an excellent investment and can be left on the camera lens to protect the lens. It is definitely recommended. The Hoya PRO1 Digital Circular polarising filter delivers excellent results with a thin profile that works with wide-angle lenses. Do you mean all the time? 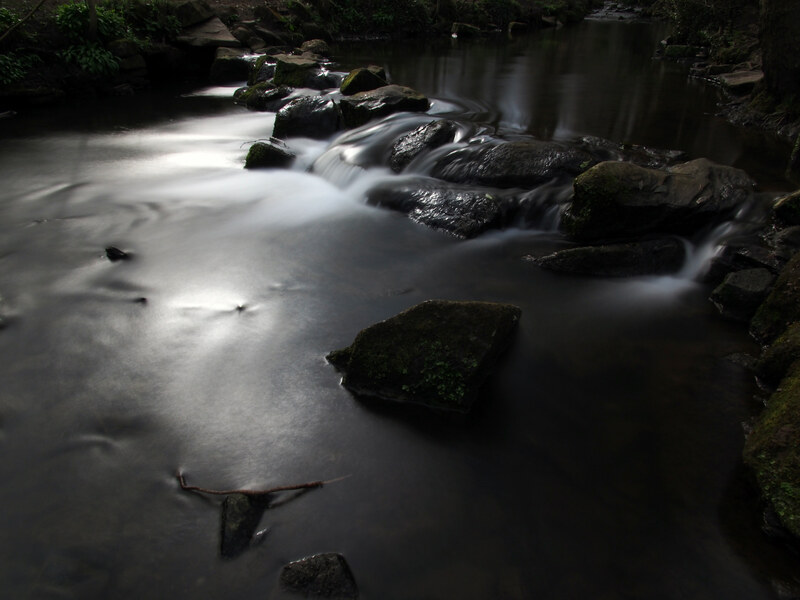 It would slow the lens down for no reason, and in typical UK weather have no other effect. Also a bit of reflection can improve a shot just as much as ruin it. Hi dannyr, if you live in a warm sunny climate where it's always sunny, then you could leave it on to protect the lens, but you're right, it's important to know when to use it.